Are you working on any craft projects? Have any sock knitting words of wisdom for us? I so wish I knew how to knit! All I can say is good luck. I am not brave enough to try socks yet. I mostly knit scarves. I tried a hat in Dec. and I am pretty sure I messed it up. I still need to take it out and start it over....not looking forward to that task at all. I'm only a beginner in the knitting department, a few scarves and two prayer shawls. Socks are next. Good luck to you! Oooh, those look very nice. What kind of yarn are you using? Those are very cute! I'm in awe of you folks who can make socks and ... gasp...mittens :) I've been knitting sporadically for about three years and haven't progressed beyond scarves and the occasional hat. Hey! These look familiar! You forgot to mention the "Turn Heel" incident! LOL I bought more needles (and yarn) for sock #2! How awesome!! I can only do scarfs and blankets! Fun! About 90% of my knitting these days is socks! I love them! Just don't be afraid of turning the heel and you'll do great! I am so impressed! I'm in the "scarves and blankets" club! So envious of people who can branch out and actually do other things. 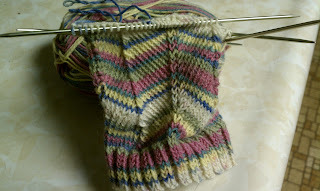 love the colors -- those are going to be so cute when you are finished.